Mirka are an abrasive manufacturing company based in Finland with offices in various countries including the UK. 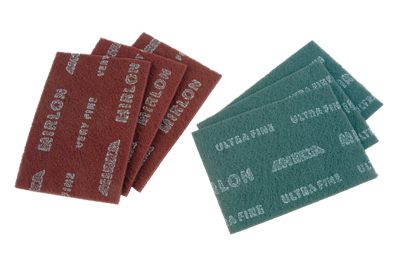 They cover the entire spectrum of abrasives but have a lot of products devoted to finishing in the automotive, metal finishing and furniture industries. 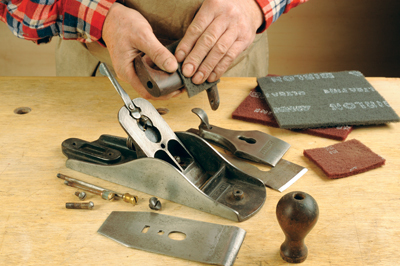 It is a competitive market and Mirka are always busy developing new products, many of which suit woodworking. On test I had two grades of Mirlon abrasive web which is intended for finishing after the initial surface preparation has been done, particularly between finish coatings or when improving metal surfaces. I tried the maroon coloured Very Fine 360 and the dark grey Ultra Fine 1,500 grades of Mirlon. If it looks familiar, it has a similar web structure to green kitchen scouring pads, but is loaded with very fine abrasive particles permanently bonded to the web. I needed a project to test both these grades on and a recent antique market acquisition presented itself; an American Sargeant wide smoothing plane dating from around 1910-18 which an antique dealer had partially 'restored', i.e. used coarse abrasive paper. Once stripped down, all the metal parts, both painted and bare, were rubbed evenly with the Ultra Fine Mirlon until a clean soft matt surface was achieved without disturbing the paint. The rosewood handle and knob had the last traces of varnish scraped off and then worked over with Very Fine followed by Ultra Fine. Again it resulted in clean matt surfaces with a slightly polished sheen, ready for waxing along with the paintwork. Using Mirlon meant not having to attack ancient surfaces with standard abrasives which would have damaged them and removed any traces of patina. You can use old scissors or a utility knife to cut the Mirlon into convenient sized pieces. Definitely worth considering if you want to improve your finishing technique.